Emanuel Lasker was born on 24 December, 1868 in Berlinchen in Brandenburg, Germany (now part of Poland). His older brother, Berthold, taught him chess when Emanuel was 11 years old. Emanuel Lasker gained the German master title at Breslau in 1889 when he won the event. Lasker actually won the event by accident. One of his opponents, needing just a draw to take first place and the master title, had a won position at the time of adjournment against Lasker. After adournment, the sealed move was made and Lasker's opponent had lost a won game. It was later discovered that one of his pawns was accidently knocked off the board between sealing and resumption of the game, which would have given him a winning advantage. As a result, Lasker, who was considering giving up chess, won the event and the title of master. Five years later he would be world champion. In 1890 in Berlin he defeated Curt von Bardeleben and Jacques Mieses in match play. In July, he and his brother tied for first place in a tournament in Berlin. Emanuel traveled to London where he defeated Henry Bird in match play. In 1891 Lasker traveled to London to run a chess pavilion at a German exhibition. He stayed in London for the next two years. In 1892 he took first place in a London tournament ahead of Henry Blackburne. He then defeated Blackburne with 5 wins and 3 draws in their individual match play. Lasker then traveled to the United States in the hopes of playing Steinitz for the world championship. In September, 1893 he won the New York International, then defeated the American champion Jackson Showalter with 6 wins, 1 draw, and 2 losses. In May, 1894 Lasker began his match with William Steinitz in New York for the world championship and won with 10 wins, 4 draws, 5 losses. Emanuel Lasker had become the second world chess champion at age 25. He received $2,000 for his efforts. Lasker took 3rd place behind Pillsbury and Tchigorin at Hastings 1895. Lasker almost died before this event and was still recovering from typhoid fever. After Hasings, Lasker wrote COMMON SENSE IN CHESS, which was published in 1896. The manuscript came from a series of 12 lectures that Lasker gave in London. In January, 1896 he won a four-master tournament in Saint Petersburg, ahead of Steinitz, Pillsbury, and Tchigorin. Also in 1896, he won at Nuremberg with 12 wins, 3 draws, and 3 losses. In November, 1896 the return Lasker-Steinitz world championship match began in Moscow. Lasker once again defeated Steinitz with 10 wins, 5 draws and 2 losses. In 1897 Lasker entered Heidelberg University, then transferred to Erlangen University in 1900, receiving a PhD in mathematics in 1902. His dissertation was on geometrical calculus and ideal numbers used in algebra. There is even a Lasker theorem in the theory of vector spaces. He was good friends with Albert Einstein. Lasker won the London 1899 tournament 4 points ahead of the rest of the field, winning 18, drawing 7, and losing 1 game. His loss came from Henry Blackburne. Lasker won the Paris 1900 tournament with 14 wins, 1 draw, and 1 loss. Lasker entered Cambridge Springs 1904 and tied for second with Janowski. The event was won by Frank Marshall. Lasker settled in the United States and in November, 1904 started LASKER'S CHESS MAGAZINE. He continued with his magazine until 1909. Lasker spent a lot of time at the Manhattan Chess Club and played many games with rising star Jose Capablanca, who was attending school in New York and a student at Columbia University. Capablanca learned much from the world champion and later defeated him in the world championship match 15 years later. In 1906 the Rice Gambit Association was formed and Lasker became its secretary. In June, 1906 Lasker won the 19th New York State Chess Championship. After 10 years of absence, the 7th World Chess Championship match was held in 1907 between Emanuel Lasker and Frank Marshall in New York, Philadelphia, Washington DC, Baltimore, and Memphis. Lasker won with 8 wins and 7 draws. In August, 1908 Lasker defended his world championship title against Siegbert Tarrasch. The match was held in Dusseldorf and Munich. Lasker won with 8 wins, 5 draws, and 3 losses. This was the first introduction of seconds in world championship play. For a time, Lasker believed Tarrasch had hypnotic powers and wanted to play him in a separate room. Lasker received 4,000 marks for his winnings. In 1908 Lasker married for the first time and became a husband, father, and grandfather all at once. His wife, a few years older than he, was already a grandmother. She died two years later. In 1909 Lasker tied with Akiba Rubinstein at Saint Petersburg. Lasker won 13 games, 3 draws, and 2 losses. Later that year Lasker played two exhibition matches against David Janowski, drawing the first one and winning the second match in Paris. These matches were not considered world championship matches. The match was sponsored by a rich painter, Nardus, who paid Lasker 7,000 francs to play a match against Janowski. In January, 1910 Lasker defended his title against Carl Schlechter in Vienna and Berlin. Lasker won the 10th and final game to tie the match with one won, 8 draws, and one loss. If Schlecter had only drawn this 71 move game, he would have been the world champion. It was supposed to have been a 30 game match, but was whittled down to 10 games due to lack of funds. The conditions of the match were never published, and it is not known if this was for the world championship title. But after the match, the rest of the world accepted it as a world championship match and declared Lasker the winner. Lasker received 1,000 marks for each game. Schlecter later starved to death after World War I. In November, 1910 Lasker again defended his title with a match against David Janowski in Berlin. Lasker won with 8 wins and 3 draws. Lasker had played four world championship matches in 4 years. After 11 years without a world championship match, Lasker then staked his title 3 times in 13 months. It would be another 11 years before another world championship match would take place. In 1911 Lasker married for a second time to a widow of an industrialist. Lasker's next tournament was Saint Petersburg 1914. Lasker won the event, 1/2 point ahead of Jose Capablanca. Lasker was paid an appearance fee of 4,000 roubles to participate in this event, the first time a chess player received an appearance pay. Czar Nicholas II conferred the title "Grandmaster of Chess" to Lasker, Capablanca, Alekhine, Tarrasch, and Marshall after they took the top five places at Saint Petersburg. Lasker was planning to play Akiba Rubinstein for the next world championship match until World War I broke out. Capablanca was also challenging Lasker and wanted to play the winner of the Lasker-Rubinstein match. World War I prevented further play by Lasker. During the war, Lasker had invested his life savings in German war bonds and lost it all. He tried to breed pigeons, but all the pigeons he bought were male. After the war he won a strong tournament in Berlin in 1918. In 1920 Lasker actually resigned his title to Capablanca without playing a match, but was given $11,000 to play a 24-game match with Capablanca in Havana. The prize fund for the match was a record $25,000, with $13,000 going to Lasker. In 1921 Lasker met Capablanca in Havana for the world championship title. Lasker was 52 years old and Capablanca was 32 years old. Lasker lost the title match after winning no games, drawing 10 games, and losing 4 games. Lasker had been world champion for 27 years, 337 days. In 1923 Lasker won at Ostrava (Mahrish-Ostrau), Czechoslovakia with 8 wins and 5 draws. In 1924 Lasker won the 1924 New York Internationa, ahead of Capablanca and Alexander Alekhine. This was Lasker's last tournament victory. From 1895 to 1924 Lasker had played in 10 major tournaments. He took first place in 8 of those events, 2nd place in one event, and 3rd place in one event. He had won 119 games, drawn 46, and lost 18 in 30 years of tournament play, scoring 78 percent in world class tournament play. Lasker continued to do well as he got older. He took 2nd in Moscow in 1925. He wrote LASKER'S MANUAL OF CHESS in 1926 (German edition) and 1927 (English edition). Emanuel Lasker returned to Berlin in 1927 and started taking up bridge and go. He became an international player and life master in bridge. He was the team leader of the German team at the Bridge Olympics. In 1933, Lasker and his wife were driven out of Germany and their property confiscated because they were Jewish. Lasker went to England in 1933, the USSR in 1935, and finally, to New York in 1937. Lasker took 5th in Zurich in 1934, 3rd in Moscow in 1935, 6th in Moscow in 1936, and 7th in Nottingham in 1936. In October, 1937 Lasker moved to Manhattan, New York and taught chess and bridge. He spent his time writing philospohical articles and a book on the community of the future. 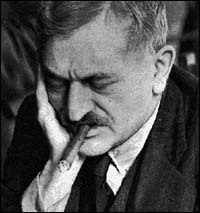 On January 11, 1941 Emanuel Lasker died in Manhattan as as a charity patient at Mount Sinai hospital. At about the same time, his sister died in a Nazi gas chamber. Lasker defended his title 7 times in 26 years. His calculated peak ELO rating is 2720. He won 52, drew 44, and lost 16 world championship games, scoring 74 points in his 112 games. His winning percentage is the highest of any world champion, with a score of 66 percent. Lasker played over 700 tournament and games, winning over 69 percent of the time.